TORRANCE, Calif., Oct 09, 2018 (SEND2PRESS NEWSWIRE) -- DocMagic, Inc., the premier provider of fully-compliant loan document preparation, regulatory compliance and comprehensive eMortgage services, announced that it has donated a shipment of its popular custom-made pink bunny slippers, which will be handed out at a blood drive event for Breast Cancer Awareness Month. Twenty percent of all donated blood will be given to cancer treatment and research. 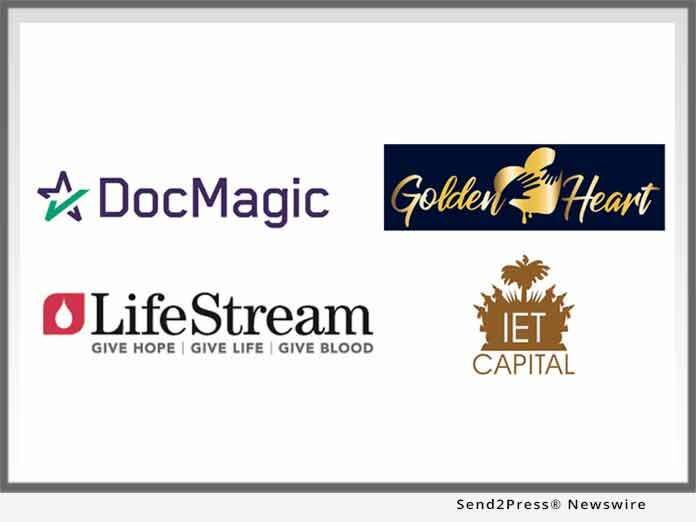 The upcoming event is being hosted by Golden Heart LA, a non-profit organization dedicated to helping children who suffer from life-threatening diseases or disabilities, and IET Capital, a real estate financing firm. Hundreds of the soft, fuzzy slippers will be on hand; anyone who participates in the event is welcome to a pair as part of the fun spirited giveaway. Founded in 1987 by Dominic Iannitti, DocMagic has had a long-time mascot named "Doc," a bunny that has become a recognizable part of DocMagic's brand within the mortgage industry. In 2016, the bunny slippers were officially introduced and handed out at a mortgage technology convention where they ended up being in surprisingly high demand. Over the years the slippers have grown in popularity. "I was at a mortgage trade show and was asked by a cancer survivor if she could have a pair for a friend going through chemo and that's what spawned the idea to donate them to worthy causes," stated Margaret Wendt, a strategic business advisor and consultant for DocMagic. "Given that it is Breast Cancer Awareness Month, we wanted to offer participants, donors and volunteers at this important blood drive something fun to take home. If the pink slippers bring a simple smile to someone's face, then it's a win in our book." Incidentally, IET Capital, a sponsor of the event, happens to be a mortgage originator and an actual end user of DocMagic's loan document preparation software, which is a widely utilized technology in the mortgage banking industry. * Location: 8056 Telegraph Road, Suite A in Downey, CA 90240 - inside the Bloodmobile. LifeStream says that it is proud to join local and national organizations to increase breast cancer awareness. To make a contribution or donate blood, people can show up at the event or contact LifeStream to make an appointment at 800-879-4484 or visit their website https://www.lstream.org/expresspass. For financial contributions, go to https://www.lstream.org/financial-gifts/. To learn more about breast cancer, visit https://www.breastcancer.org/, which is a non-profit organization dedicated to providing the most reliable, complete, and up-to-date information about breast cancer. Golden Heart LA can be found on Instagram @goldenheartla and IET Capital's website is https://ietcapital.com/. DocMagic, Inc. is the leading provider of fully-compliant loan document preparation, compliance, eSign and eDelivery solutions for the mortgage industry. Founded in 1987 and headquartered in Torrance, Calif., DocMagic, Inc. develops software, mobile apps, processes and web-based systems for the production and delivery of compliant loan document packages. The company's compliance experts and in-house legal staff consistently monitor legal and regulatory changes at both the federal and state levels to ensure accuracy. For more information on DocMagic, visit https://www.docmagic.com/.